Next time you're out singing in the rain, give yourself a spotlight! 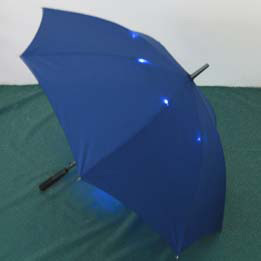 This oversized blue umbrella comes packed with LEDs circling the top, giving you a cool effect standing underneath as well as for onlookers as you approach. There's even a mini flashlight in the handle. Powered by 3 AAA batteries (not included). So stay dry and stay fly with your unique modded umbrella from Xoxide!